ME SUPERB Smart Finder - Key Finder Wireless Bluetooth Tracker. ✓ ANTI LOST & FORGOT ALARM: Keep track of important things with ease. Simple to use, smooth app interface, loud, and durable. ✓ COMPACT SIZE: It is a small and thin Bluetooth key tracker, which makes it the perfect fit for your key or wallet. ✓ ATTACH IT TO ANYTHING: This locator tracker is widely used in daily life, help to find your keys, phone, wallet, pet, purse, luggage and anything you always lost. 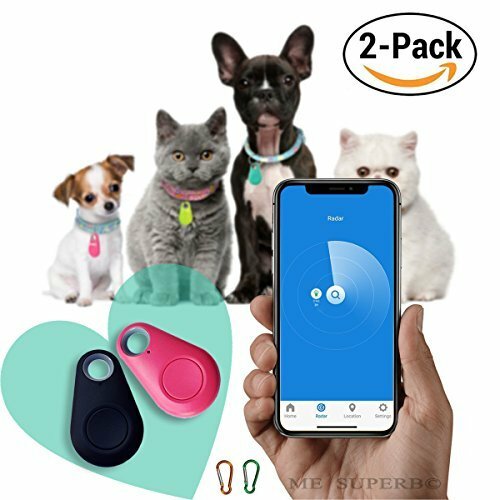 ME SUPERB DEALS Bluetooth Tracker -- Leave you away from unnecessary troubles like losing keys, pets, phones, wallets, bags, luggage, kids and so on. The effective distance of tracker is 75 Feet in open range without barrier. With the device, your belongings, kids and pets won't leave your attention any more. ✓ SATISFACTION GUARANTEED: We take great pride and care in manufacturing and developing only the highest quality products for our new and loyal customers! ***Every order is backed by a one-year "NO QUESTION ASKED" warranty. If you don't love this product, contact us and we'll either replace them or issue you a full refund. ✅ TRACKER FUNCTION : Anti-lost alarm can effectively protect your kids, pets or valuables from being lost or stolen within 75 Feet/25M effective distance range, when out of this range your phone and this device will automatically ring for a timely warning. ✅ SMART & EASY TO SET UP : Locates where you last left your item to the nearest street and then give you the signal strength guiding you to your lost item! Through precise calculation, locate your pet, wallet and etc. via digital display, and you can even locate Your Phone by pressing the button on the gadget it will send the phone a ringing noise until you locate your phone. ✅ WHAT'S IN THE BOX : 2 Wireless Key finders (Black & Pink) and 2 Aluminum Caribeaner Clips, which allows you to easily hook your key finder into your key chain. ✅ LONG BATTERY LIFE SUPPORTED : Benefiting from the built-in low consumption Bluetooth 4.0, the battery can last for about 6 Month.Uses one CR2032 coin battery (included). ✅ HASSLE-FREE WARRANTY - Every order is backed by a one-year "NO QUESTION ASKED" warranty. If you don't love this product, contact us and we'll either replace them or issue you a full refund.